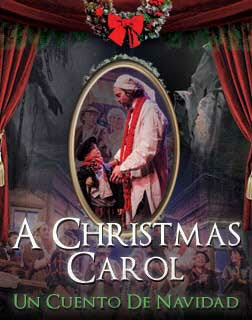 The crotchety counter of coins, Ebenezer Scrooge, is visited by three ghosts from the past, present and future. Join in the journey as they try to enlighten him to see his past mistakes and what might be done to change his future. Will his humbug of a heart remain in Christmas? Or will Scrooge be persuaded to learn from his mistakes, to find the good in mankind and the message of love and giving that defines the Christmas season? Come and share this magical telling of Dickens' classic tale with us on stage….. with traditional Christmas Carols sung along the way.